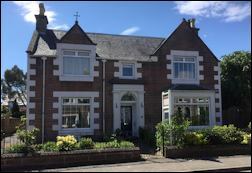 Quality accommodation in detached Victorian house. Not far from the River Ness. Easily accessible from all roads into Inverness. Members of Ancestral Tourism Welcome Scheme. Storage for cycles. Off street car parking. Scottish Tourist Board 3 Star Gold Award. 1 double/twin with private shower room. 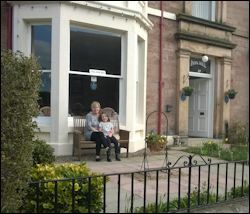 B&B prices from £39 per person. Full range of breakfasts provided. Vegetarians welcome. and relaxing surroundings in a 'home from home' atmosphere. 5 double ensuite bedrooms (1 can be configured as a twin).. Spacious lounge with a selection of books, games and magazines. No smoking. No children under 16. Locked storage is available for bikes, golf clubs, etc. 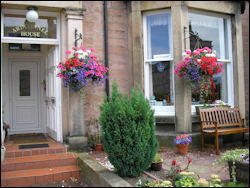 B&B prices from £29.50 per person (2 sharing). Under new management (June 2017). Victorian villa 5 minutes walk from the river. 10 minutes walk to castle and theatre. 1 single room with a private shower room. The double room is on the ground floor (no stairs). Child rates for children under 15. Victorian villa less than 10 minutes walk from the river. of the castle, theatre, shops, pubs & restaurants. Friendly owners who can help with tour bookings & local family research. 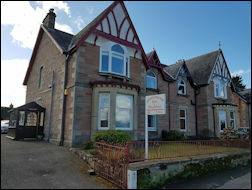 Historic property built in the 1860s with links to the Bishops of Inverness. 1 single, 1 twin, 4 kingsize doubles. 1 double room is on the ground floor (no stairs). Some rooms have garden views. Residents' lounge. Selection of DVDs and CDs. Web site includes 360 degree Virtual Tour of the bedrooms. Located not far from the castle and river. 1 ensuite twin room, 1 twin room, 1 single room. 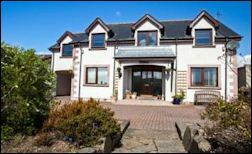 10 minutes walk from Inverness city centre. TripAdvisor Certificate of Excellence every year 2013 - 2017.
with digital TV, hairdryer, hospitality tray, luxurious bedding, toiletries. Off street parking for cars. Covered shelter for motorbikes and bicycles. Garden with sheltered seating area. 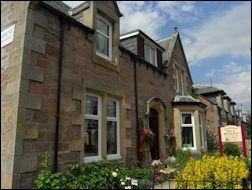 B&B prices from £45 per person per night (based on 2 sharing). Storage for bikes. Off-street parking. 5 minutes walk from the river. with Freeview TV, hairdryer, tea/coffee. Under new management. Redecorated in 2017.
overlooking the River Ness and Eden Court Theatre. 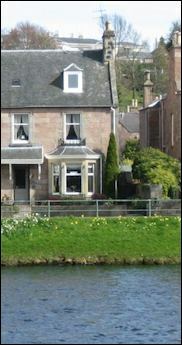 5 minutes walk from Inverness castle. 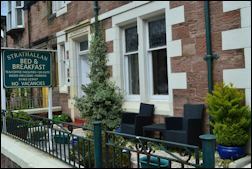 Walking distance from bus/train stations, shops & restaurants. 6 bedooms: 2 single and 4 double rooms. All with ensuite shower, TV, radio, hairdryer, etc. B&B from £37.50 per person (2 sharing). Private parking. Lock-up shed for bicycles. No smoking. No pets. No children under 7.